Well, it won’t surprise you to hear that I think they are on theologically dodgy ground. Christians should affirm the resurrection of Jesus, however much they struggle to reconcile it with their rational assumptions. Unless it is affirmed, this whole religion is obviously toast. And yet, Hobson urges a certain degree of restraint in our responses to such people. After all, our universal human experience is that dead people stay dead. To say otherwise flies in the face of all that we know about how the world works. This Eastertide, let us remember these followers of Jesus who struggle to believe—especially as we read the story of Thomas. When Thomas missed an encounter with the risen Christ that the other disciples experienced, he found their account too good to be true and demanded proof: “Unless I see the nail marks in his hands, put my finger in the wounds left by the nails, and put my hand into his side, I won’t believe” (John 20:25). The story the others tell Thomas was (frankly) unbelievable, but it was true. As the passage progresses, Jesus’ second appearance gives him the confirmation he needs. This text can be a springboard for participants to express their own doubts and questions about the resurrection. Few if any of us understand fully what the resurrection of Jesus means, and fewer still have never wondered how such a thing could even be possible. This Easter, we would do well to sit for a while with Thomas and wrestle with our own struggles to believe. Theo Hobson, “In Defence of Christian Doubt,” The Spectator, 10 Apr 2017 . • What is your first response when you hear that a modern-day faith healer has raised someone from the dead? Why do you respond this way? • Why might someone—even a believer—struggle to affirm that God raised Jesus from the dead? • Where can we identify with Thomas? • Jesus pronounced a blessing on those who “don’t see and yet believe” (v. 29). How can we claim that blessing for ourselves? • What can bring us, like Thomas, to worship Jesus as “my Lord and my God” (v. 28)? Thomas had not been present when Jesus appeared on Easter day to his disciples, and when they told Thomas about it, he vowed that he would not believe in the resurrection until he had touched Jesus’ hands and side; later generations nicknamed him “doubting Thomas” because of this vow. A week later Christ appeared again to the disciples, with Thomas present, and Christ offered to allow Thomas to touch his hands and side. He then commanded Thomas to stop doubting and to have faith. Thomas did exactly that, and he gave to Jesus one of the most direct confessions of faith in the NT, “my Lord and my God” (v. 28). 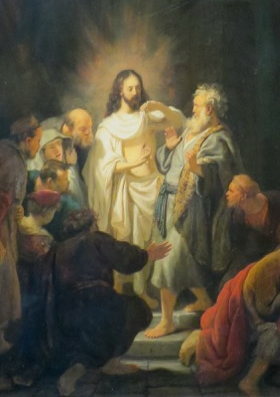 Jesus commended him and offered a blessing on all who, unlike Thomas, trust in Christ without benefit of seeing his risen body. Fisher Humphreys, “Thomas,” Mercer Dictionary of the Bible, ed. Watson E. Mills et al. (Macon GA: Mercer University Press, 1990), 911. “Blessed [cf. 13:17; Rev 14:13; 19:19; 20:6; 22:4; Lk 10:23] are those who do not see and yet believe” (v. 29b). Congratulations to those disciples who believe in Jesus whether or not they have experienced him during his earthly career. Charles H. Talbert, Reading John: A Literary and Theological Commentary on the Fourth Gospel and the Johannine Epistles (Macon GA: Smyth & Helwys, 2005), 266.